My 17-year-old son and I decided to go to India this summer, including visiting Mumbai for six days. I decided that we should try to find some good project to donate things to during our visit. I found out from internet searches that you could take tours in Dharavi slum area with Reality Tours & Travel, so we finally opted for that. 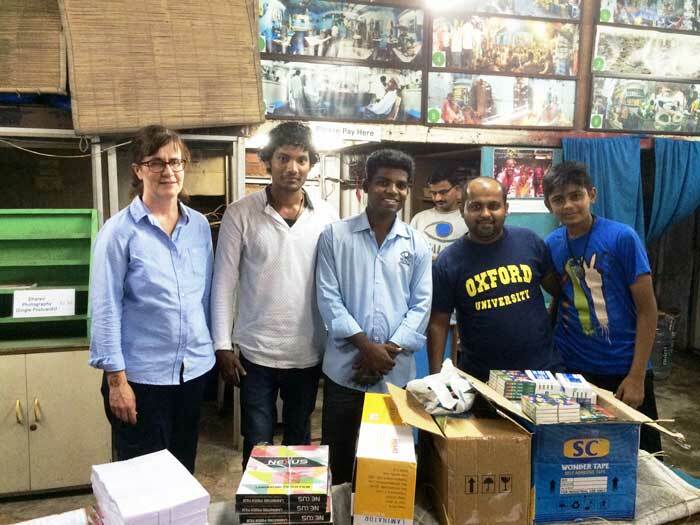 During my internet searching I also managed to find out about the Pack for a Purpose organization and found a fitting project in Dharavi that we could visit during our trip. 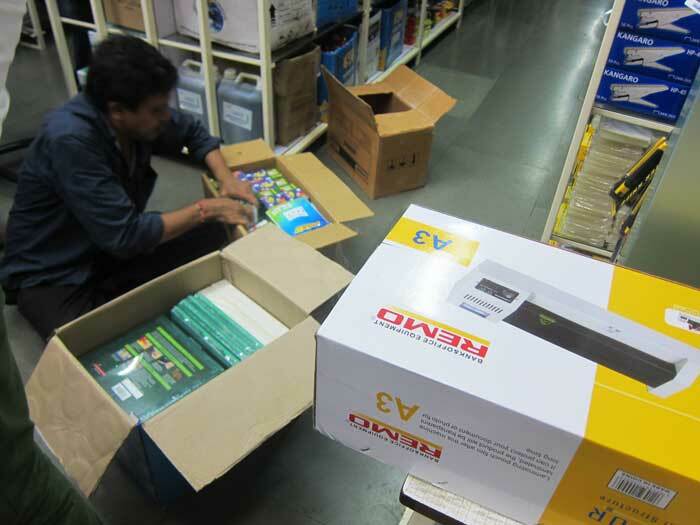 Because things are so much cheaper to buy in India than in Sweden, I decided to buy the supplies on-site in Mumbai. I started asking my closest friends and family to donate some money, and by the time we were in Mumbai, we had 23,000 rupees to spend. One day we had a driver take us around the city while one of our Indian friends was also accompanying us. We tried to shop in one of the markets but did not find a suitable shop, so our driver made some calls and helped us find the really perfect place—a wholesaler that carried exactly everything we needed. One guy from the shop picked us up from the car and took us by foot for about 10-15 minutes into small, narrow streets in the heavy rainfall. Finally we reached the little shop in the picture below and they were most helpful in digging out everything we needed. My son kept track of the sum spent during our shopping. It felt quite strange (but very good) to buy 2,000 sheets of plastic for a laminator, 100 boxes of crayons, hundreds of pens and pencils, pencil sharpeners, scissors, erasers, notebooks, whiteboard markers and so on, filling box after box. Our friend also bought one bag of supplies from her and her husband, so we raised some awareness even locally, which felt extra good. Once the buying itself was over, everything had to be transported on an old bicycle to our car. 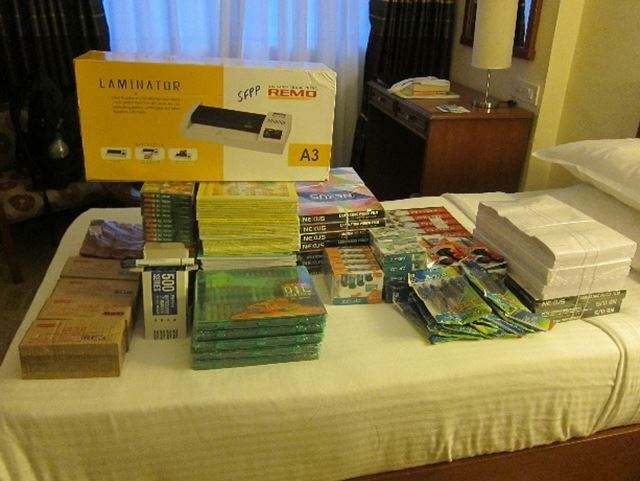 In the hotel, we unpacked everything and we were quite amazed of how much we could get for that amount of money. The supplies might have weighed around 25-30 kilos. We also added one book about Sweden so the school could remember that they had some Swedish visitors this year. On our visit day, we started out by taking a tour of Dharavi slum together with our nice guide Balaji (middle below). It was really interesting to take the tour with him, as he is also living there himself. In the community center we handed over the supplies, and they seemed quite happy being able to get this for their schools. So, we said goodbye for this time. I will sure try to do something similar next time I am traveling to a country with similar needs.